It’s been twenty years since I became a certified PADI scuba diver, and I still recall an important lesson. Attentively listening to my dreamy scuba instructor, I learned that one of the most important things to remember while under water is to “breathe continuously and relax.” He emphasized that this could save your life under water to avoid an air embolism and is a good motto to live by while above water. Scuba humor aside, I found this to be great advice and often repeat it to my patients in my chiropractic practice. Effective (and continuous) breathing using the diaphragm is important to maximally oxygenate the blood and is helpful for reducing muscle tension, anger, anxiety, irritability, fatigue and in the treatment of stuttering. Healthy diaphragmatic breathing stimulates the parasympathetic nervous system slowing the heart rate and relaxing muscles. The diaphragm is a large sheet of muscle that extends across the bottom of the rib cage and separates the thoracic cavity (heart, lungs and ribs) from the abdominal cavity. Although sometimes overlooked as a passive organ, it is actually the primary breathing muscle, performing 80 % of the work. During inhalation, the diaphragm contracts pulling downward and enlarging the thoracic cavity. This creates negative pressure and draws air into the lungs. When the diaphragm relaxes, it rises up and pushes the air out of the lungs. With so many daily stressors, it is common to breathe shallowly from the chest and shoulders, taking only minimal breath into the lungs. Chest breathing is inefficient and requires extra effort from the accessory muscles in the upper chest and back, along the ribs, and in the neck. Shallow breathers are usually unaware of their condition and often carry resulting tension in their neck, shoulders, and upper back. Something as simple as learning proper breathing technique can reduce muscle tension and improve quality of life. A great example of healthy diaphragmatic breathing technique can be found in a baby or small child as their chest and upper back are relaxed as their rib cage expands. 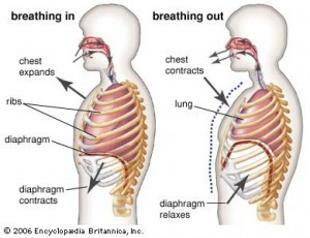 Yogic three-step breathing,or yoga breathing, is a good way to learn how to breathe with the diaphragm. Sit or lie down comfortably, with loose clothing. Put one hand on your chest and one on your stomach to feel the motion as you breathe. Slowly inhale through your nose or through pursed lips (to slow down the intake of breath). As you inhale, feel your stomach expand with your hand, then using your diaphragm expand your rib cage allowing a full breath to enter your lungs. Finally feel the air enter your chest all the way up to the clavicles or collar bones. Slowly exhale through pursed lips to regulate the release of air, emptying the chest first and ending with the diaphragm relaxing pushing the rest of the air out of the lungs. Posture: The way you sit and stand can contribute to unhealthy breathing patterns by restricting movement of the diaphragm and result in shallow breathing. Loosen up your clothes, stop holding in your belly, let your shoulders relax and your head lean back. Practice: Take time to practice your healthy breathing and periodically check your breathing throughout the day. Remember to breathe continuously and relax. Healthy diaphragmatic breathing helps to improve lung capacity, calm the nervous system, stimulate the cardiovascular system, and reduce muscular tension. While driving your car, sitting at your desk, or standing in line, remember to breathe continuously and relax. 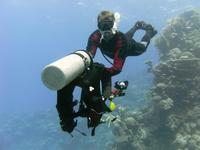 And, in case you are wondering what became of that dreamy scuba instructor – he’s now my husband.